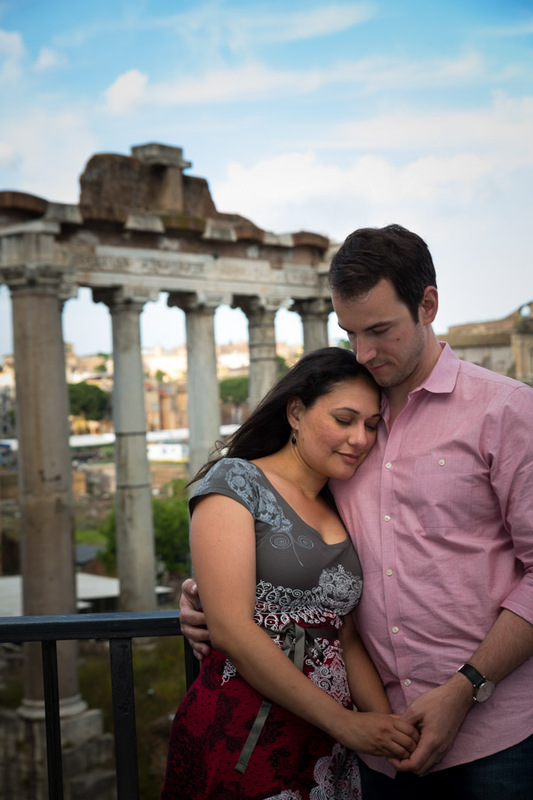 We met on a beautiful sunny day in Rome with the rhythm of a Michael Jackson soundtrack playing in the background. The music was coming from one of the many street artist which perform here in the large square. 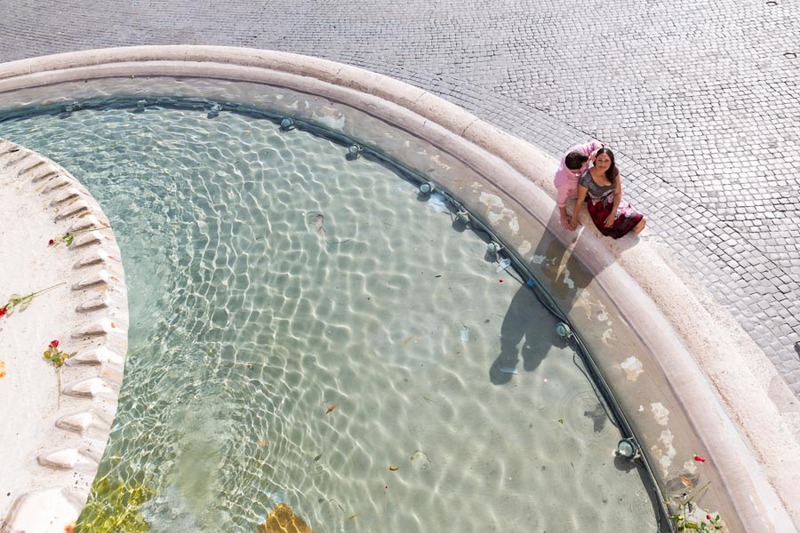 We moved our way to a side fountain where we started the engagement style session. On our way up to Villa Borghese we stopped in Basilica Parrocchiale Santa Maria del Popolo to peak in at one of the two Caravaggio paintings that are contained inside. These paintings represent great inspiration for photographers that wish to understand how to light a subject. Even though this can be quite related, let’s get back to photography! 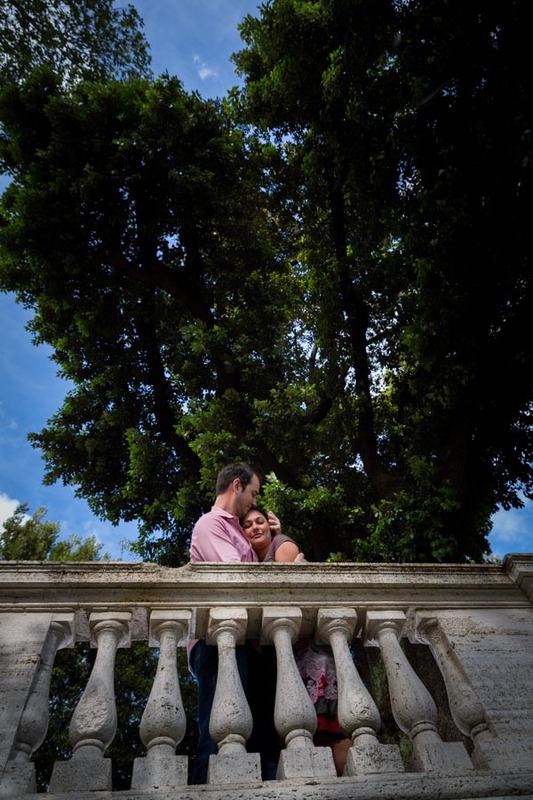 There is a spectacular view from above which makes for perfect backdrop pictures. One over the piazza below and another spot where you can see all the beautiful roman rooftops. This is where we spent a little bit of time before walking over to the adjacent Trinita’ dei Monti and Piazza di Spagna. 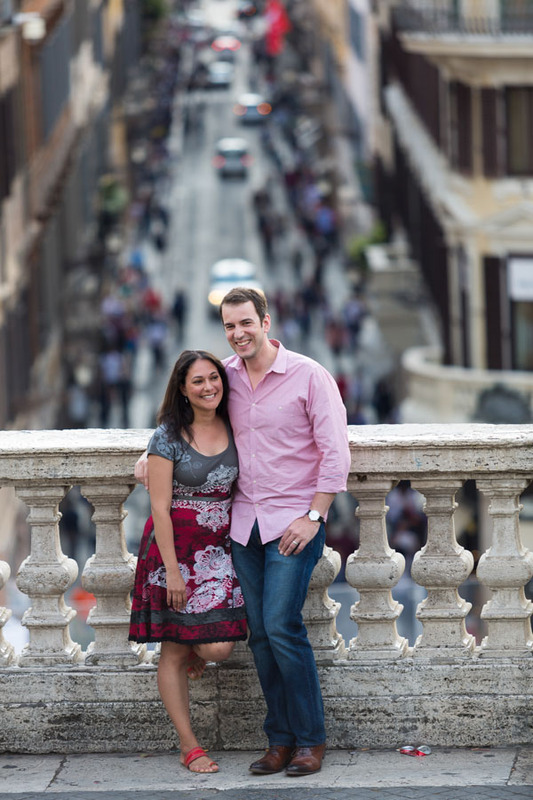 Here we photographed our way down the Spanish steps framing in different angles and views. We took the long way to reach the fountain by including Via Condotti in our walk. 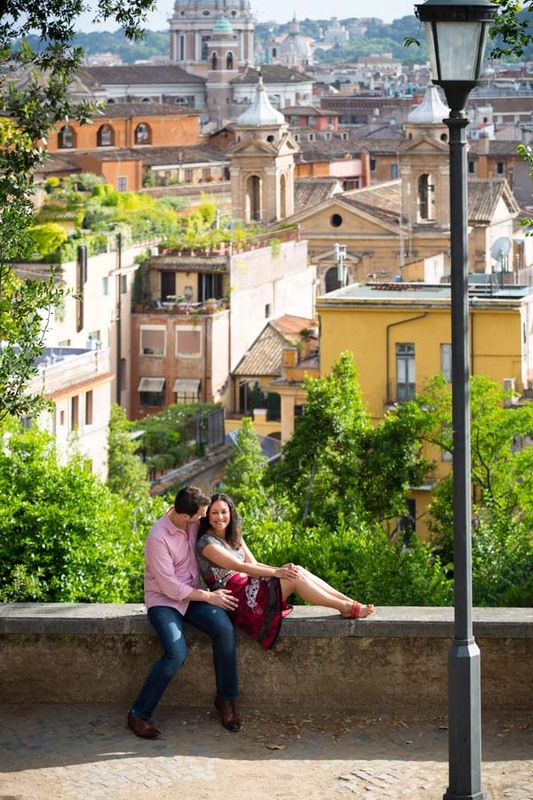 Which is the heart of the city center fashion district in Rome. Some showcases can really be worth a picture as they are often set up with beautiful colors and decorations. 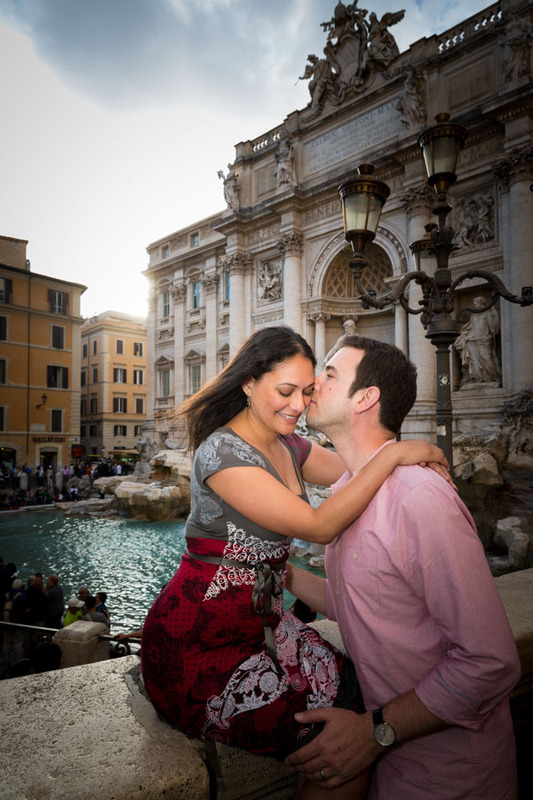 A stop over at the Trevi fountain is a must as this is a really unique visit. A triumphant example of Baroque architecture nested on an historical building surrounded by soft natural lines over water and pagan figures. Just a fabulous location to include. It offers so many great photo ideas. Lots of different settings available so close to one another. 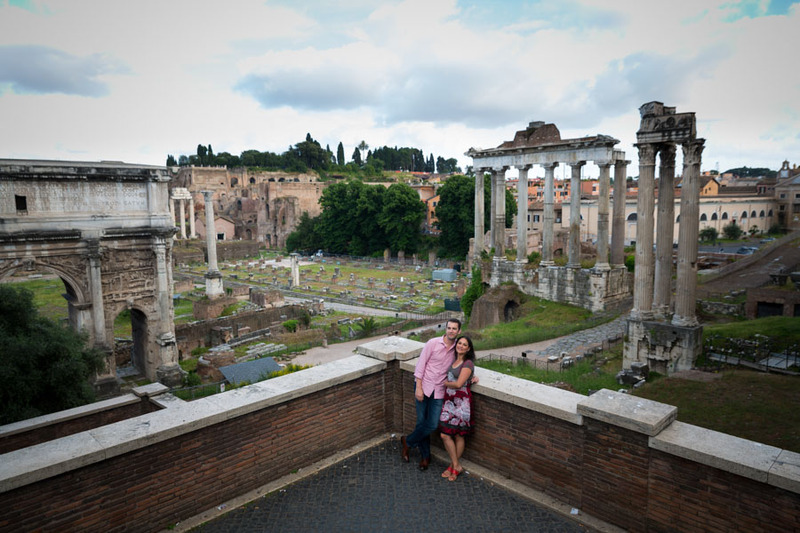 Starting from the incredible view that you have over the Roman Forum and the ancient remains. There are also many different staircases and columns which offer different lighting opportunities. Here the Caravaggio examples come back to mind. It is certainly the Roman Colosseum. Which unfortunately is currently under restoration. Specifically on the side that I prefer the most. The good side of this is that this forces me to find new and creative angles and views. So I came a little before the engagement photo session to scout out a good spot. And here it is. Hope you like the pictures! 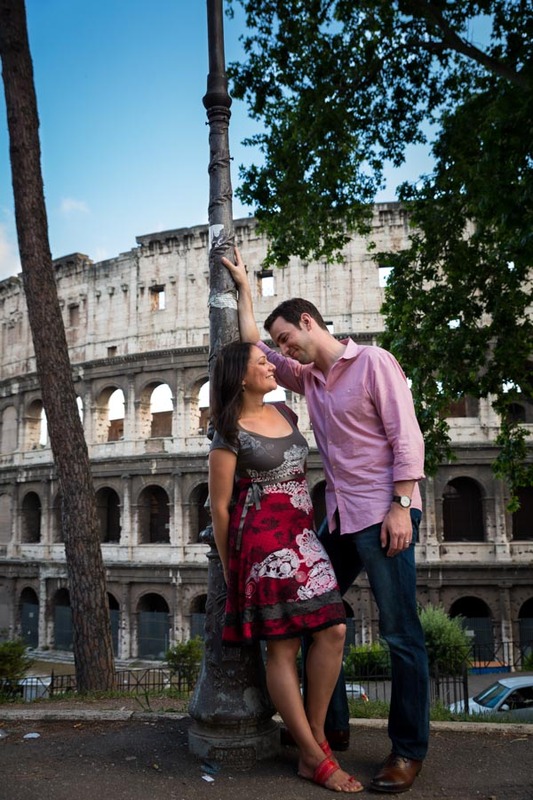 A creative photo session in Rome starting from Piazza del Popolo and taking a nice long walk around the city. Including the very know landmarks but also little street corners and alleyways which make the city so distinctive.